Matter Control: The Molecule Man has the ability to control all matter on a molecular level. His typical use of his power is to mold matter to his whim, disrupt matter into dust or liquid, and convert one substance into another. He has also used his power to animate, fly and control complex machines. The full range the Molecule Mans powers remains unknown, but he was able with the help of the Silver Surfer to affect the Earth on a planet-wide scale. Originally, he subconsciously limited himself to being able to affect only inorganic materials but later, there seemed to be no limit to his power. 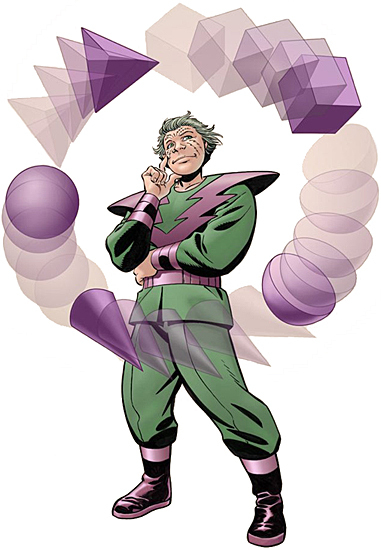 Wand: The Molecule Man originally focused his powers through a wand. He was able to store his life force in his wand, and then mentally take over anyone who handled it, and even create a new body for himself. Owen Reece was a small, frail, timid child who obsessively clung to his mother. He grew into a weak-willed adult, made bitter and lonely by his mother's death, and full of fear and hatred of what he regarded as a deeply unfriendly world. Reece became a lowly laboratory technician working at a nuclear plant owned by the Acme Atomics Corporation. He was disgruntled by his job's long hours and low pay. One day, growing careless, Reece accidentally activated an experimental particle generator, which bombarded him with an unknown form of radiation. The radiation had a mutagenic effect on Reece, releasing his potential for psionic powers on a cosmic scale. Reece could now control all matter, even down to the molecular level, and all energy. The radiation also left markings resembling lightning bolts across Reece's face. Reece named himself the Molecule Man after his power to control molecules.